The goal for 1st graders is to understand the book they read and the books that are read to them. They can answer questions about the story and find evidence by flipping through the book’s pages to point out and prove their answer. Children show their understanding by retelling about the characters, setting and important events from the story. If the book is nonfiction, they can describe important facts from the book. They can even act out a story! Reading at home for enjoyment is the best and easiest daily routine you can have to help strengthen your child’s understanding of stories. 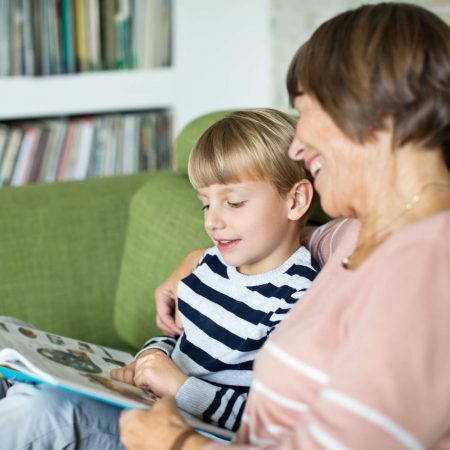 Asking simple questions about the characters and talking about best parts of a book gets your child thinking about the story and making connections to their own life. After reading a story use your hand to help you remember the most important elements of the story. This technique can be used for people ages 4 to 94! As your young reader matures, they can demonstrate their understanding in more sophisticated ways. When asking them questions from the story, have them prove their answers by showing you the pages and words that describe the event. Books are the best way to expose children to new vocabulary, stories and higher-level thinking skills. But reading on their own is not the only way to access stories. Read alouds and audio books offer the same benefits and let children enjoy a great book. The NC Kids Digital Library offers hundreds of picture read alouds that let your child hear stories and build their reading skills. These passages are well suited for first grade. Parents can read the sentences aloud or read them together with their child. This app can be used on your phone or tablet to access the NC Kids Digital Library for free read along books.